Welcome to the twenty-first edition of the Grab Bag of miscellaneous miner tears. We're still going strong! In the beginning, people thought we wouldn't last a month. Yet here we are--here to stay. Prior to my CSM announcement in Brapelille, I happened upon a container with some nasty mudslinging. That's politics for you. Smileing Bob might not have realized that you can click on any container and discover who anchored it there. Bad Bob, bad! ...and Jimbo1976 scolds her for spamming. 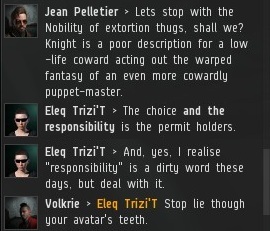 These rebels are so sensitive. 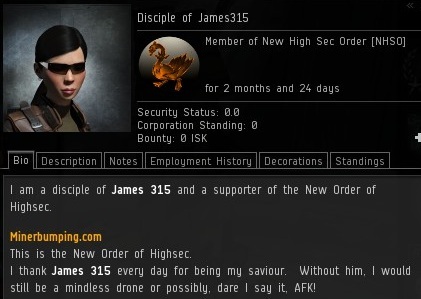 There are a lot of characters with "James315" or some variation in their names these days. How refreshing to see someone who uses my name in a positive way. The rebels don't understand the idea of being for something, rather than only being against something. Nihilists. The same miners who will spend years doing nothing but scooping space rocks in silence will criticize others for trying to contribute something to the community. In the beginning, the rebels would always say the New Order was losing, and was bound to collapse any day. 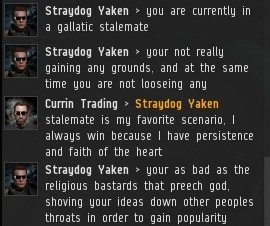 Today, Straydog Yaken concedes it's a stalemate. Seems to me that we've been growing quite a bit. 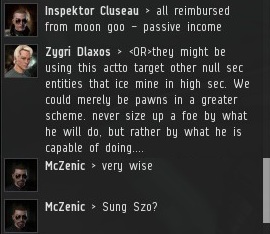 If this "stalemate" keeps up much longer, highsec will be ours in no time at all. Logically, if something's harassment just because a space lawyer says it is, then I can call myself a space lawyer and declare it non-harassment just as easily. 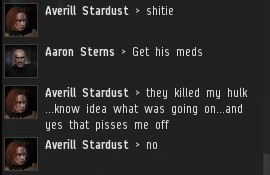 Averill Stardust has spent the last eight years mining in highsec, until we killed his Hulk. If we had only known his situation was that severe, we would have arrived much sooner. 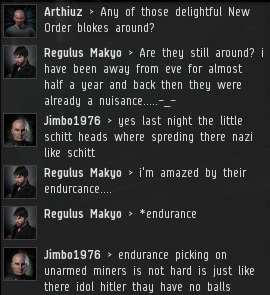 There's a genuine rift among the mining community these days. 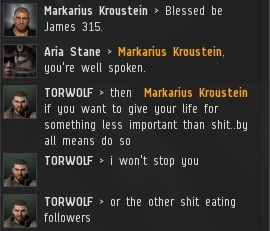 Some pay us, and others are angry at those who pay. 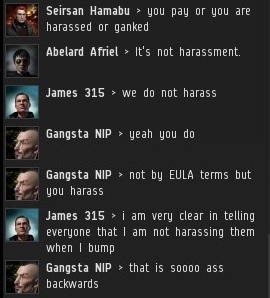 I guess it comes down to what you're more afraid of: The most fearsome miner gankers in highsec, or a bunch of AFK carebears? Makalia's attitude is common among the carebears. 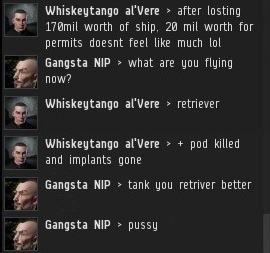 Even though CCP recently stated that miner deaths are at "historic lows" post-barge buff, miners still think there's way too much miner ganking now. If Sun Tzu were alive today, would he suspect the New Order of being an elaborate Goon/TEST plot? No. He would be an enthusiastic Agent of the New Order. "Knight" is a good name for our suicide gankers. Honour, skill, power, bravery, heroism... It's all there. 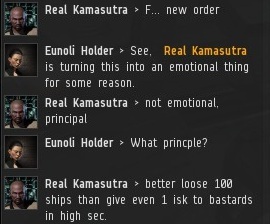 Real Kamasutra is a believer in carebear math: It's better to lose billions of isk than to pay 10 million for a permit. Why? Because buying a permit is a recognition of the fact that you're playing a multiplayer game, and that you must adapt to account for the actions of other humans. That's one thing no bot or bot-aspirant can do. Sun tzu would not be a member of the new order, he enjoy a challenge. he would teach the miners how to avoid your forces (if he even could). than he would sit back and watch the show. See which side uses his principles best. Sun Tzu did not enjoy a challenge. He enjoyed winning. The best way to win is to make sure you have accounted for and removed all potential challenges before fighting. Have you actually read Sun Tzu? All of that seems to describe precisely what James and the New Order do. "For it is precisely when a force has fallen into harm's way that is capable of striking a blow for victory." stike when they think you are defeated. if we follow this "we shall succeed in the long run in killing the commander-in-chief." Someone needs to make a Knight named Sunny Tsu. Sunny Tsu sounds like a great name for a panda. 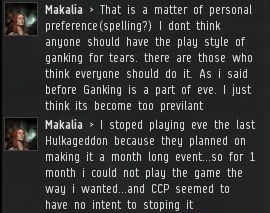 Not sure Eve with pandas will work, although CCP seems intent on pandering to the carebears in empire. See what I did there? Now hopefully the CSM will get a realistic spokesman for what Empire should offer all players. The opportunity for riches fame and glory. Yeah, and that means all miners should get killed because they want to mine. It's a sandbox people, if you want pure PvP/PvE go to WoW.